Have you heard of Partner Next? It’s Microsoft’s new online platform designed to provide IT professionals with Cloud-focussed tools and resources. And yes, Cloud-focussed means that on Partner Next, you can find a number of interesting Dynamics 365 videos and links. At this point, ten Dynamics 365 training video modules are available. To get access to them and to more resources, subscribe to PartnerNext. The modules will take you through the essential information you need in order to get started with Dynamics 365 across all its applications (including sales, customer service, operations, financials, marketing…). 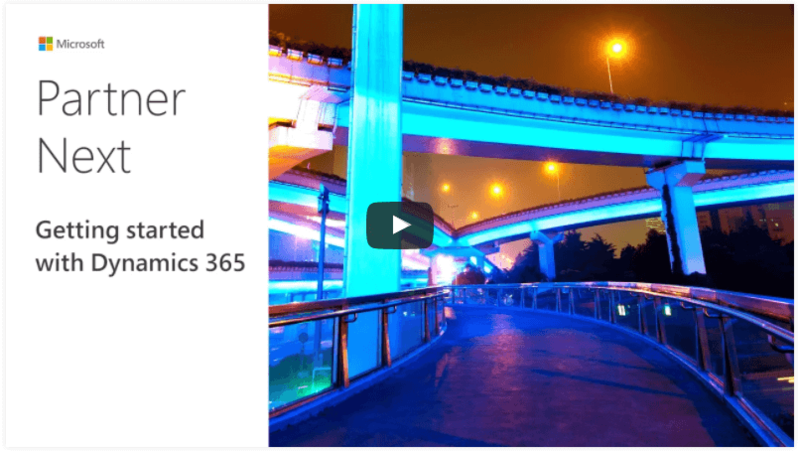 Each video comes with additional links to other useful Dynamics 365 online resources that you can use to go further into the topic at hand. This is a great, interactive source of information which we encourage you to check! If you would like to go even deeper into Dynamics 365, here are a few useful links that will direct you to more online training and professional tools. You can start by taking a look at our Dynamics 365 Readiness guide, then reviewing the current Dynamics Learning Portal course catalogue for Dynamics 365 (last updated on April 7th 2017).